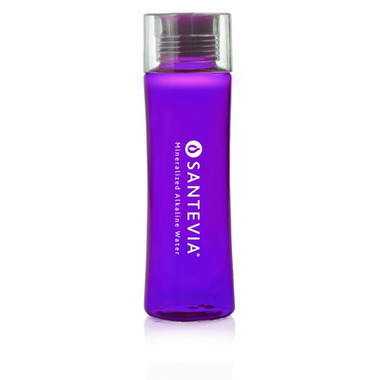 With its sleek and contoured easy-grip shape, the Santevia Tritan Water Bottle is the perfect eco-friendly companion for the gym, yoga studio, hiking, or just on the go. It fits conveniently into most cup holders and bike bottle cages. I love this water bottle. The colour is beautiful and functional - whenever I lose track of where I left it, it's colour makes it easy to spot! This is the second Santeva bottle that I've ordered. My daughter's friends knocked to the floor on the first day she took it to school. Guess what? It didn't break! Also, in case you were wondering--you don't have to use this bottle with any of the accessories (crystals and alkaline sticks) if you don't want to. It's a great water bottle even if you don't care about alkaline water at all. This is the first bottle that my daughter hasn't broken! It's really sturdy and survives being crushed into an overfilled backpack as well as being dropped. Both the bottle and lid are dishwasher safe. The bottle never leaks. This is honestly a great purchase. The cost does not even remotely touch the quality. The colour is vibrant, the bottle itself is super durable and the lid is great for protecting against leaks. LOOOOVE IT. Love this water bottle. I ordered a few in different colours. Durable. Dishwasher safe - Keep away from element if you put it in the dishwasher.